Has good reviews and look really good, so if anybody needs a little gift. FOUR UNIQUE SCENTS - Defined by an unconventional sense of sophistication, with a taste which is rarefied, yet a touch audacious. The natural plant extracts & essential oils allow for natural healing effects from clear skin to enhancing the senses, & helping to relieve muscle tension, stress & better sleep. Inspired by the four seasons the scented candles provide a timeless and elegant experience, infused with a charming dash of wit and whimsy. 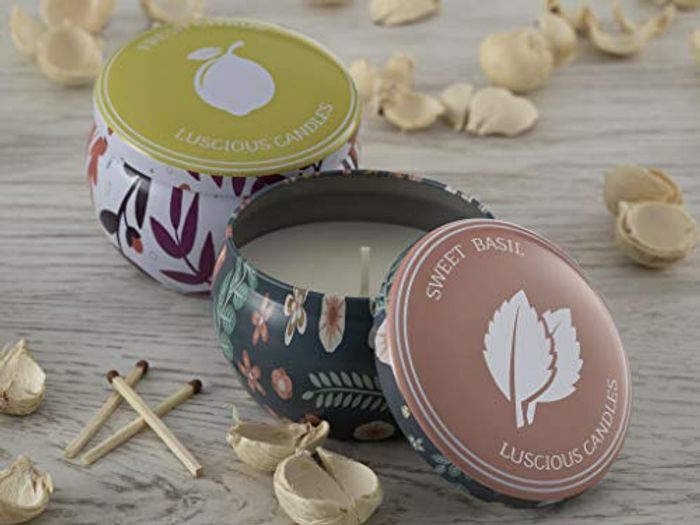 LONG BURN TIME - Each Scented beautifully designed Tinplate Candle contains 4.2 oz or 120g of pure soy wax, filling your house with the heavenly odour of fresh scent, you can sit back with ease and enjoy a wonderfully fragrant burn time of 25-30 hours, perfect for home, office and church. There are 4 Tinplate scented candles, totalling 100-120 hours burn time altogether.